Whether it’s the association with famine or worries over the plant’s high starch content, the plain ol’ white potato gets a pretty bad rap. While some typical forms of the humble potato—think French fries and deep-fried chips—can certainly be less than healthy, the world’s fourth largest food crop (after rice, wheat, and maize) is actually a nutritional powerhouse when consumed in a thoughtful manner. Use this comprehensive guide to make the most of this nutritious and delicious vegetable, from buying to storing and preparing. Even though they are relatively high in carbohydrates compared to other vegetables, potatoes can be a part of a healthy diet. A medium potato (with a diameter of between 2 ¼ to 3 ¼ inches) contains about 130 calories, 30 grams of carbohydrates, and 3 grams of protein. In their natural state, potatoes are also completely free of fat and cholesterol and very low (10 milligrams per medium potato) in sodium. Potatoes are heart healthy. Potassium, calcium, and magnesium can help naturally lower blood pressure, reducing the risk of stroke and heart disease. Fiber and niacin can help improve blood cholesterol levels, also lowering the risk of cardiovascular disease. As an additional benefit, potassium is essential for brain, nerve, and muscle health, and to maintain fluid balance in the body. Last but not least, fiber promotes digestive tract health. Potatoes keep bones healthy. In addition to being great for heart health, potassium may help maintain bone strength and protect against bone loss. 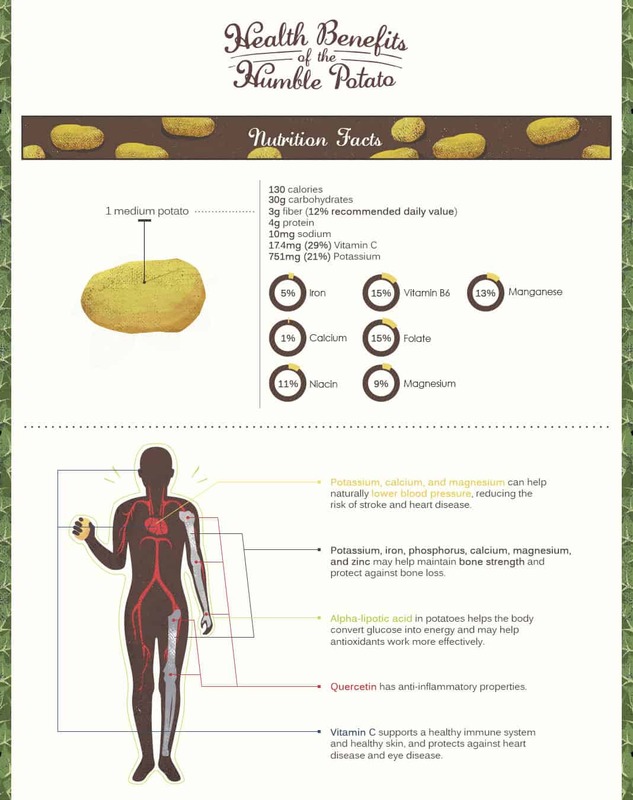 The iron, phosphorus, calcium, magnesium, and zinc in potatoes also help keep bones healthy and strong. Potatoes contain a healthy dose of alpha–lipotic acid, which helps the body convert glucose into energy. Some studies also suggest it plays a role in controlling blood glucose levels, improves vasodilation, and assists in preserving brain and nerve tissue. Plus, alpha-lipotic acid may allow antioxidants to work more effectively. Potato skins contain quercetin, a flavonoid (or type of antioxidant) with anti-inflammatory properties. Potatoes are rich in vitamin C. Vitamin C is essential for a healthy immune system and healthy skin, and helps protect against heart disease and eye disease (among other benefits). With so many varieties, shapes, and sizes, picking the perfect potato can be tricky. No matter what type, opt for firm and smooth potatoes. Avoid any that feel soft or wrinkly, or appear discolored—all signs of deterioration. Potatoes like room to breathe, so steer clear of those sold in plastic bags with no ventilation—chances are they’ll spoil more quickly than their loose-binned friends. Starchy potatoes contain less water than other types, allowing the starch inside to expand when cooked to create an airy and flaky texture. This makes them perfect for frying and baking, as well as mashing (that fluffy texture easily absorbs milk and/or butter!). Waxy potatoes are low in starch and high in water, which helps them hold together well when cooked, and makes them perfect for wet cooking methods such as boiling or cooking in soups or stews. They also have thin skins, which makes them easier to consume without peeling. Waxy potatoes are great roasted, too. These potatoes—you guessed it—fall somewhere between the other varieties in terms of starch and water content. Because of their balance between starchy and waxy, these potatoes are extremely versatile. They vary widely in color, too. While Yukon Gold potatoes have a yellow hue and rich flavor, there are a number of types of purple and blue flesh in this category as well. While they may look quite different from “normal” potatoes, the flavor and texture are nearly identical to their more conservative-looking cousins. Sub in purple or blue potatoes in that mash, salad, or side to make a statement at your next dinner party. Potatoes need a dry, dark, cool home (such as a pantry or cabinet). Light causes potatoes to sprout and turn green. When they turn green, they develop solanine, a toxic compound that can make you sick with symptoms including cramping, headaches, diarrhea, and fever. If your potatoes do develop a green coloration, it’s not the end of the world—just trim the affected areas before using and you should be fine. At room temperature, most potatoes will last about one to two weeks without any deterioration. If you can find a cooler space—say, between 45 and 55 degrees Fahrenheit—they can last up to three months. While cool temperatures help extend the shelf life of our favorite root vegetable, avoid anything below 45 degrees. Storing whole potatoes in a very cold environment such as the refrigerator can cause the starch to turn to sugar, yielding a sweet and unpleasant flavor. Wherever you store them, potatoes should be kept in a loosely closed bag or covered basket so air can easily circulate. In general, potatoes will get along with anything else you’re storing in the cabinet. However, keep them away from onions—both emit natural gasses that will cause the other to decay more rapidly. Potatoes are simple to prepare and they can be cooked using just about any method. Regardless of the end product you’re going for, the first step is to scrub them clean. Before using, run potatoes under cold water while rubbing with hands or a soft-bristled brush to remove any dirt and debris. After they have been washed and patted dry, look over each piece and remove any sprouts (aka “eyes”) or bruises using a sharp paring knife. Many peelers also have a special notch on the side or tip that can be used to remove eyes, too. Next, it’s time to pick a cooking method and prep accordingly. Most of the methods below work for potatoes with or without skin. If you want to peel the potatoes, a potato or vegetable peeler is the easiest way to go. If you’re confident with a knife, you can also peel the spuds with a sharp paring knife, but be careful—potatoes can get slippery! Boiled potatoes have a few main uses: They make a great simple side dish, or can be turned into potato salad or mushed into mashed potatoes. When boiling, always start with cold water. If you plunge them into boiling water, the outside of the potato will cook faster than the inside, causing them to fall apart. Cover the potatoes with just enough water to submerge completely, allowing them to cook evenly without moving around too much. To ensure even cooking, use potatoes that are the same size, or cut large potatoes into equally sized pieces. Boiled potatoes are done when a paring knife or fork is easily be inserted into the center of the potato and comes out without any resistance. When using potatoes in soups or stews, opt for a low-starch, high-moisture variety such as Red Bliss, New, or Fingerling. In order to ensure even cooking, cut potatoes into equally sized pieces and cook until a knife or fork is inserted and removed without resistance. They key to perfect mashed potatoes is to remove the water: After boiling and draining the potatoes, put them back in the dry pot or pan in a single layer, and then place back over low heat. Gently stir until the potatoes are dry but not browned, about one to two minutes. Then, proceed as you normally would, adding milk, butter, and other seasonings. As a general rule, one pound of potatoes will yield about 1¾ cups mashed. The lack of moisture in starchy potatoes creates a soft, fluffy interior and crispy exterior when fried. Whether you’re using bite-sized pieces, shreds for hashed browns, or a more traditional French fry shape, dry the potatoes before throwing them in the hot oil to avoid painful and messy splatters. Simply pat with a towel before cooking, or for hashed browns, twist up in a kitchen towel to remove moisture. Remember this rule: Two trips to the fryer is better than one. The first dip cooks the interior at a lower temperature (300 to 325 degrees Fahrenheit) and the second creates the crisp exterior at a higher temperature (350 to 375 degrees Fahrenheit). Given their mild flavor and simple preparation method, baked potatoes can easily stand in as the base for any meal. Follow this golden rule for baking potatoes: Use a fork to poke holes all over the spud before placing in the oven. Steam that builds up in the potato while cooking needs to escape. Otherwise, the potato could explode while cooking resulting in a huge mess. For crispy skin, bake on the rack in the oven—do not wrap in foil. To reduce baking time and prevent skin from cracking, rub the spud with oil before placing in the oven. Roasted potatoes make a great side dish, but they’re also fantastic alongside other roasted veggies. Cut spuds into smaller pieces to allow the inside to cook through without burning the edges. If you want larger pieces, try parboiling before baking to help make sure they cook through. Potatoes can be microwaved when there just isn’t time for baking. Simply rub the potato with oil and poke all over with a fork, and microwave for about 10 minutes, turning over halfway through. It’s done when a fork or knife is inserted and removed without resistance. Use these the same way you would baked potatoes. Don’t cook potatoes too hot. Studies suggest that potatoes, when cooked above 248 degrees Fahrenheit, produce acrylamide, a compound found in plastics, glues, dyes, and cigarette smoke that has been found to play a role in the development of several cancers. 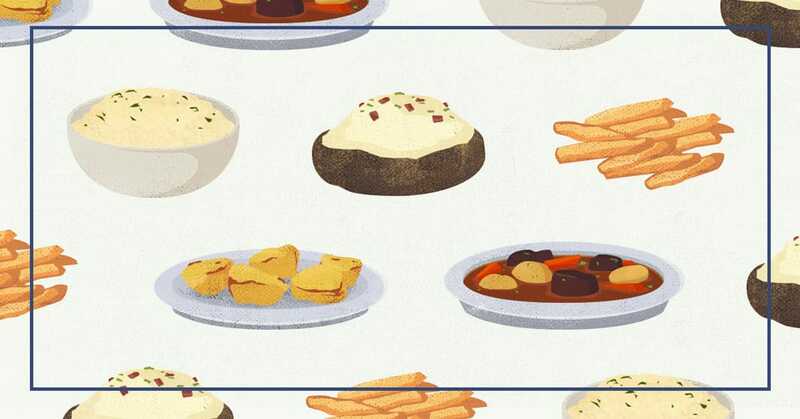 Fried potato products, such as potato chips and French fries, are relatively high in acrylamides (as well as fat and sodium), so it may be advisable to opt for healthier preparations. You can boil potatoes peeled or with the skin on, but they will fall apart less if they are left whole or in large pieces with the skin still on. Use a stainless steel knife instead of carbon steel to cut potatoes and prevent discoloration. It’s the preparation that can take potatoes from healthy to “Health Hell.” Instead of topping your hot potato with gobs of butter, sour cream, and cheese, try subbing in healthy and flavorful alternatives such as Greek yogurt, salsa, or homemade chili. When left to sit, sliced potatoes oxidize and turn brown just like apples, bananas, and some other fruits. While prepping your meal, place sliced or diced potatoes in a bowl of cold water to prevent browning. Much of the nutritional benefit is found in the skin (vitamins, minerals, fiber) so if it’s the nutrients you’re after, eat them with the skin on. To retain potassium content, bake rather than boil: A boiled potato contains about half the potassium of a baked potato. Cut potatoes can be prepped and stored for up to 24 hours ahead of use if you need to. Simply cut the potatoes, cover them in cold water, and store in the refrigerator until ready to use, up to 24 hours. Cooked potatoes store perfectly in the freezer. Wash, peel, and boil potatoes; cut into bite-sized chunks or mash; and store in airtight containers or freezer bags for up to a year.